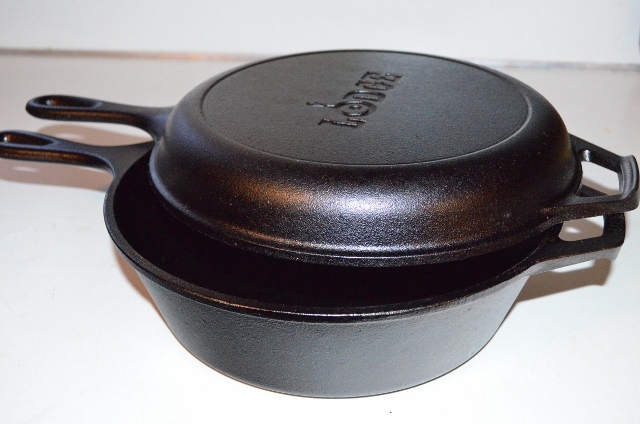 One of my sons is a fan of cast iron cooking when he is camping. 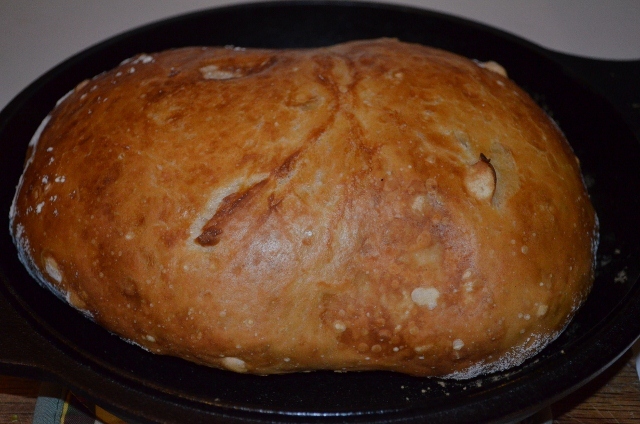 As he was looking online at various recipes using cast iron pots, he ran across the technique of baking bread, using a no-knead recipe, in a cast iron Dutch oven. We decided to give it a try and the results are fabulous. I have baked bread at home for many years and I have never been able to get the crusty layer like you find in bakery bread. Baking the bread at high temperature in the cast iron, gives the bread a wonderful crunchy crust with a still soft interior. Rather than a Dutch oven, we used the Lodge Combo Cooker. We had read that it is easier to put the dough in the Combo and remove the cooked bread. If you use the Combo Cooker, you put the dough in the lid and then turn the deep part of the cooker upside down and use it for the lid. 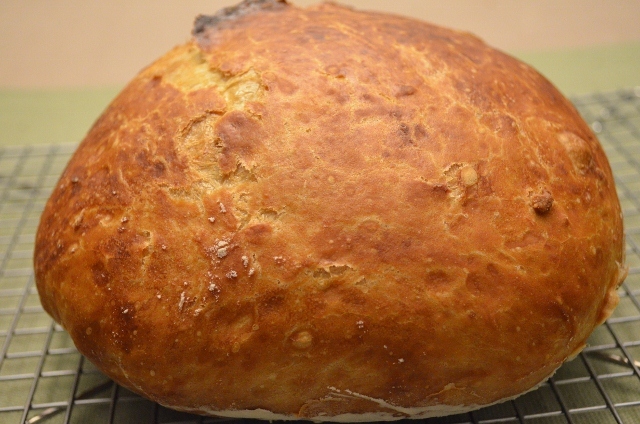 Whether you use the Combo Cooker or a regular cast iron Dutch oven, you will have wonderful bread that tastes like it came from a very expensive bakery. 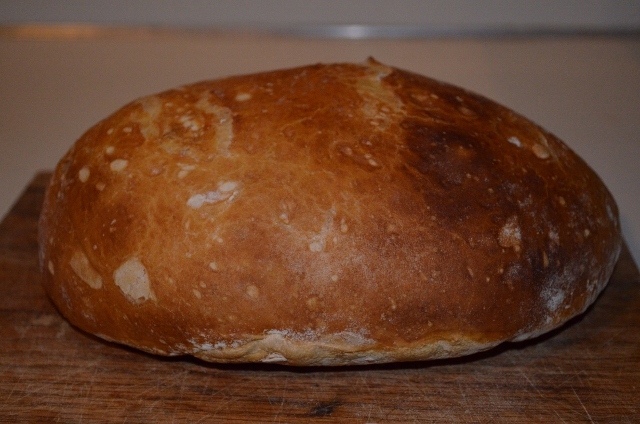 The other thing about the bread, it is super-easy to make. It only takes a few minutes to mix the ingredients, then it sits for 12-18 hours. After the proofing period, you heat the oven, place the pot in the oven to heat and while it is heating form the dough into a mound. Then you place the dough in the super-hot pot (Be careful! 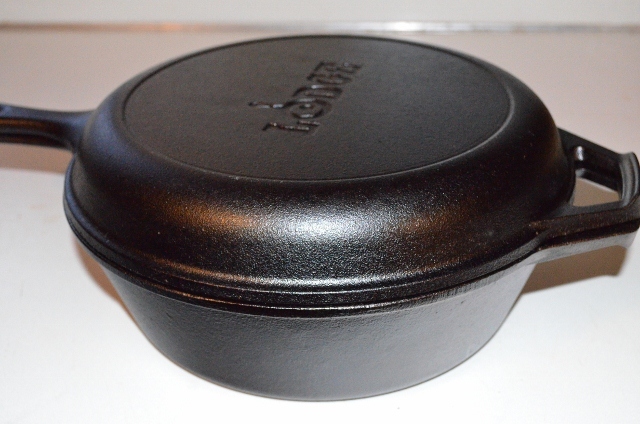 ), place lid on pot, put in hot oven and bake. After thirty minutes you remove the lid and bake a little longer. I used the recipe and technique found at Simply So Good web site. The recipe is easy to follow and there are lots of variations. So far we have made the plain bread and cranberry-pecan bread. Both were outstanding. Next weekend, we will try the cheddar-jalapeno bread with some chili. There are also more recipes and videos at Breadtopia. He has a different technique for the dough and I have not tried it yet but his variations look great. 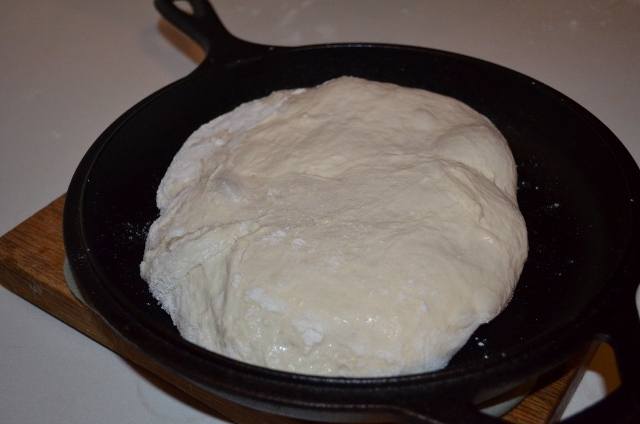 If you love great bread–you must try cast-iron no-knead baking! Heat oven to 450 degrees. When oven reached 450, please pot and lid in oven for 30 minutes. 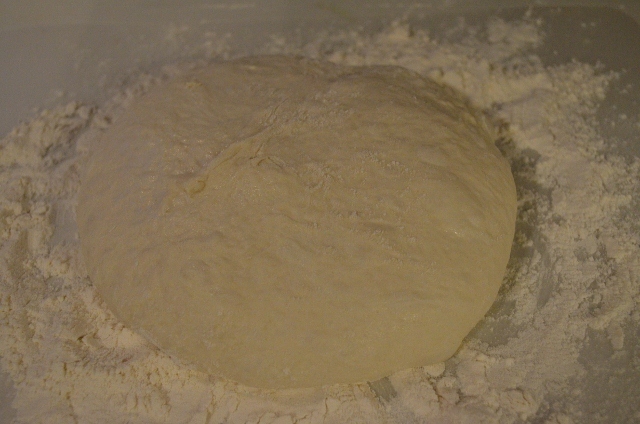 While the pot/lid is heating, remove the dough from the bowl onto a well-floured surface and form into a ball. 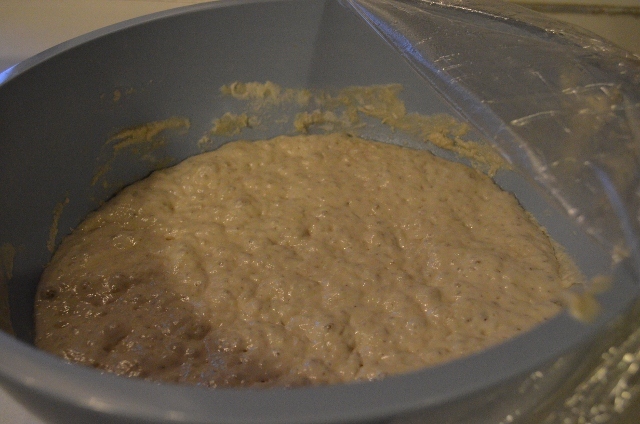 The dough is very sticky but do not knead and handle as little as possible. After heating for 30 minutes, remove the hot pot from oven and place dough in pot (or in lid if using Combo). Depending on how long the dough has set, it can be tricky to handle–a dough scraper can help move the dough to the hot pot. Cover and place in oven for 30 minutes at 450 degrees. After 30 minutes, remove the lid and bake an additional 15 minutes. Remove from oven and cool on a rack. Cranberry-Pecan variation will be posted later this week—scrumptious! Cook 30 minutes at 450 with lid on pot and then remove lid and cook an additional 20 minutes. Mary–I used the same recipe! It is the first time I’ve been able to make a a really sturdy crunchy crust as well. Fun to see your post!